The purpose of this project is to reconstruct the roadway pavement on Rue des Trappistes, and replace the culvert crossing at Westendorf Coulee under Rue des Trappistes, to improve its strength, safety and functionality. The culvert at Rue des Trappistes and Westendorf Coulee needs to be replaced as it is at the end of its service life, and is partially collapsed in several locations. A preliminary design study was completed in 2016, and the project is now moving ahead with construction. The project includes culvert replacement starting in November 2017, and road reconstruction from Pembina Highway to Rue du Monastere starting in spring 2018. The culvert crossing is now open to traffic. Culvert replacement work has been substantially completed at this time. The remainder of culvert construction and roadway reconstruction work from Rue du Monastere to Pembina Highway will begin when weather permits and could begin as early as May 2018. Another update will be provided before the road work begins. The replacement of the culvert crossing at Westendorf Coulee under Rue des Trappistes and the reconstruction of the roadway pavement on Rue des Trappistes from Rue du Monastere to Pembina Highway has been approved by City Council as part of the 2016 Capital Program of the City of Winnipeg, Public Works Department. Construction of the culvert replacement will start towards the end of November, 2017 and is expected to be completed mid-March 2018. The work will involve demolition of the existing metal culvert and installation of new concrete pipe culverts. 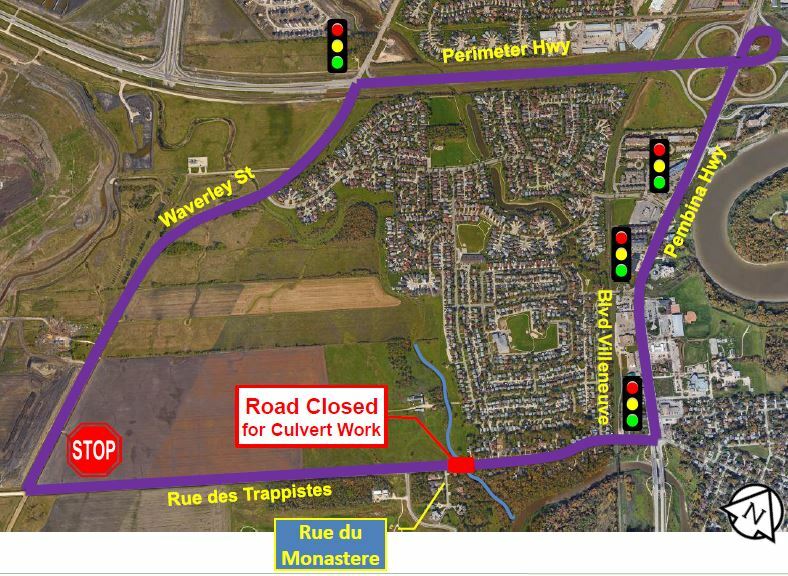 During this period of winter culvert construction, Rue des Trappistes will be fully closed to all modes of transportation at the culvert crossing. Thank you to everyone who came out to a public information session on September 27, 2017. Roughly 24 people signed in and 14 exit surveys were completed. An online comment form available on this page until October 4, 2017 collected an additional five submission. Your feedback has been shared with the project team. Further information on feedback provided by citizens is available in the public engagement report. If you would like to stay updated on City of Winnipeg public engagement events, follow the City on Facebook and Twitter or sign up for the City of Winnipeg public engagement newsletter. The culvert at Rue des Trappistes and Westendorf Coulee needs to be replaced as it is at the end of its service life, and is partially collapsed in several locations. In 2016, a sinkhole developed under Rue des Trappistes at the culvert which required immediate stabilizing with the addition of several cubic metres of fill and ongoing monitoring to ensure that conditions remain safe. A preliminary design study was carried out to determine when construction should take place, what type of structure is best suited for site conditions, and to determine the class 3 cost estimate of approximately $2 million for culvert replacement and road reconstruction. The preliminary design revealed that conditions for culvert replacement are best and most economically feasible during the winter and the best structure for replacement was determined to be a pre-cast concrete pipe. The culvert replacement will take approximately five months to complete, from November 2017 to March 2018. Road reconstruction will start in spring 2018 and will take approximately 3 months to complete. Will streets be closed for this work? Rue des Trappistes will be closed at the Westendorf Coulee for approximately five months between November 2017 and March 2018 for culvert replacement, with additional local lane closures in spring of 2018 for road reconstruction. Approximately $2 million for both culvert replacement and road reconstruction. Why does the culvert need to be replaced? The culvert at Rue des Trappistes and Westendorf Coulee needs to be replaced as it is at the end of its service life, and is partially collapsed in several locations. In 2016 a sinkhole developed under Rue des Trappistes at the culvert which required immediate stabilizing with the addition of several cubic metres of fill and ongoing monitoring to ensure that embankment conditions remain safe. An image of the detour route is below. What route will construction vehicles take? Construction vehicles will take Pembina Highway to enter Rue Des Trappistes. Will there still be access to Southwood Golf & Country Club and Trappist Monastery Provincial Heritage Park? Access to both will be available via Waverley Street to enter Rue Des Trappistes, and then Rue des Ruines du Monastere. What impacts are expected during construction? During culvert replacement starting this November, residents on the west side of Westendorf Coulee will not be able to access Pembina Highway directly, but instead will need to travel west on Rue des Trappistes and north on Waverley Street. The City will work to mitigate construction impacts as much as possible. What will be done to protect environmentally sensitive areas and Westendorf Coulee? Best management practices for working near waterways that include the appropriate implementation of soil erosion control measures will be followed. Exposed slopes not covered with rock will be vegetated. Work inside the Westendorf Coulee will not occur between April 1 and June 30 2018. Culvert construction will occur in late fall and winter when water levels are lowest and the potential for runoff is reduced thereby minimizing water management requirements.